From the personal scrapbooks of Lt. 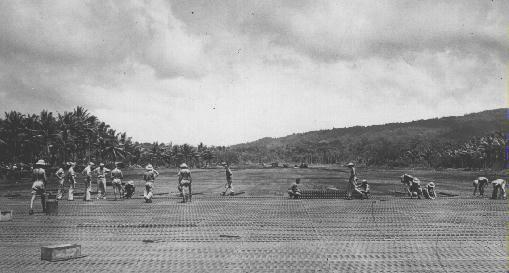 Colonel O. Howard Davidsmeyer, Sr.
Picture of soldiers creating Number Three airfield at Milne Bay in Papua New Guinea. Photo taken October 10, 1942 by SSA 41st Division. According to the site PacificWrecks.com, the No. 3 strip is called Turnbull Airfield and is still in use today. It was named in honor of Squadron Leader Peter Turnbull, winner of the DFC, who was killed on August 27, 1942, and buried at the edge of the strip. Soldiers bathing in stream with Army jeeps crossing river in background.